WASHINGTON — In the wake of the smoke-filled Metro ride that left one person dead and dozens sickened, Virginia’s Commonwealth Transportation Board on Tuesday heard about the difficult situation the state faces when it comes to transit funding. The director of Virginia’s Department of Rail and Public Transportation, Jennifer Mitchell, told the board that dwindling transportation funding could lead to dramatically diminished state spending within the next few years. 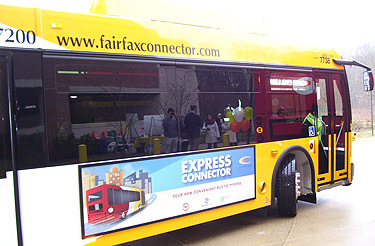 She expects that could lead to major cuts to services such as the Fairfax Connector that are used by tens of thousands of riders each day. “Most local operators do fund transit through their general funds, and so those are funds that are often competing with things like schools and police stations and other capital needs,” she says. All this comes before considering funding for Metro’s “Momentum” initiative, which Metro and regional transportation leaders have described as a desperately needed way to add capacity to the system that will allow the region to grow as projected, while adding less traffic to the roads. The plan includes several phases, including a new Potomac River crossing and upgrades to run more eight-car trains and improve reliability. “The WMATA 2025 program is really the next major reinvestment program needed for WMATA to expand core capacity, and frankly it’s got tremendous benefits for Virginia, and [it’s] really the only way that we’re going to be able to move more people on the Metro rail and bus system in the future,” Mitchell says. Virginia passed a landmark transportation funding bill in 2013, with additional changes in 2014, but Mitchell says the bills don’t provide as much of a backup plan for transit funding as they did for roads. Part of the measures would have designated sales taxes collected from online retailers to specific transit uses, but Congress hasn’t passed the Marketplace Fairness Act, which would allow states to collect those taxes. “Overall, the assets that [local transit operators] have, they will be trying to stretch those out over a longer period, and it just becomes a sort of downward, circular decline of performance over time,” Mitchell says. That decline is projected to include fewer new bus stop shelters, transit centers, buses and work connected to parking garages. The board also meets Wednesday to take up a number of issues, including the approval of a $50 million loan to the City of Alexandria to help pay for the planned Potomac Yard Metro Station. The station would be a so-called “infill” station, situated on the existing Blue and Yellow lines near the Potomac Yard shopping center. The board also is scheduled to move forward with a potential public-private partnership to add lanes to I-66 outside the Beltway. That project is expected to be High Occupancy Toll lanes, similar to the new Express Lanes on Interstate 95 and the Capital Beltway. At the meeting Tuesday, Gov. Terry McAuliffe, a Democrat, talked about new protections for taxpayers tied to public-private partnerships in the wake of criticism of the McDonnell administration. McAuliffe and Del. Chris Jones, R-Suffolk, are backing a bill they say will increase transparency and reduce risks. The bill will be considered during this winter’s General Assembly session, which begins at noon Wednesday. Click here to see a PDF highlighting funding issues from the Virginia Department of Rail and Public Transportation. Follow WTOP on Twitter and on the WTOP Facebook page.